I've always known the biggest competitor to Steemit wasn't going to be another Decentralized Social Network, but a blockchain that was built on top of an already established Centralized Social Network and Snax is looking and going just that. 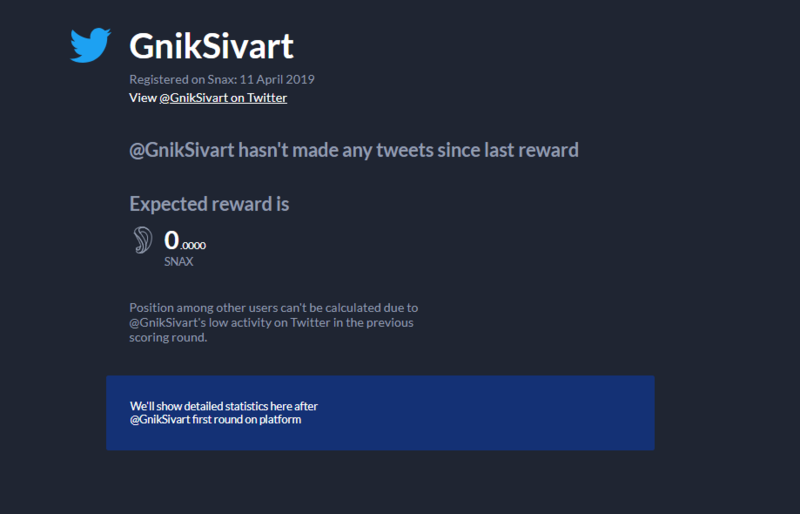 Snax, according to it's whitepaper, is a "Decentralized Social Media Overlay" and just created it's first block yesterday 4/10/2019. Weaknesses - Early adopter advantage of "easy rewards" due to lack of competition and the struggle of competing with other well established platforms such as Facebook, Reddit, and Twitter. Strengths - creators can receive additional income streams using social networks and platforms they are already familiar with. Weaknesses - to receive rewards an extension or some sort of wallet/application has to be installed and other barriers to entry for new users. Snax uses a DPOS consensus algorithm style blockchain similar to EOS and Steem in which block producers are elected by those who stake the Snax Utility Token. They provide additional details and information as to how attention can be valued, token supply and rewards, and Snax utility in the white paper and I won't be covering it here for now. The first thing you'll need to do is to download the snax.one extension on the google chrome store and set-up your wallet. Once that is completed and your private key is saved somewhere securely, you'll be asked to make a tweet to Authenticate your Twitter account. After a few minutes you should be able to visit the snax.one website and log-in your online dashboard/wallet. Looks like Snax is already aware of the issues with account creation and cost of running a dApp on other platforms like EOS and is staking the pre-mine of 16 billion they receive at the launch of the blockchain to help pay for account creation and provide a fair RAM price to protect dApp developers from speculation. 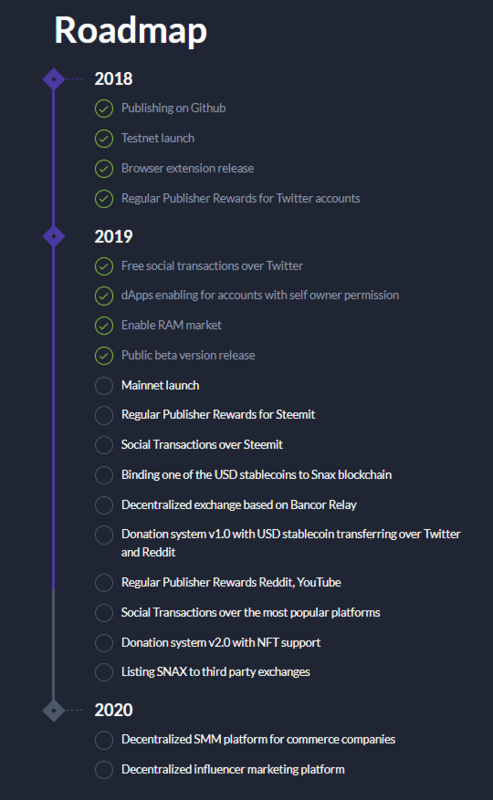 According to Snax's roadmap, it looks like the next step for the project is to integrate rewards onto the Steemit platform and allow for social transactions over Steemit. Some other highlights that I see is moving rewards onto other centralized platforms, creating a decentralized exchange, and then getting Snax on third party exchanges by the end of the year. One strength I see in Snax is the "free" rewards. Too many times I see blockchains try to market themselves as social blockchains, but then require users to purchase the coins to be able to distribute them to others such as Reddcoin or Investfeed, essentially tipping others with your own money. I much rather Steemit style rewards in which others are rewarded from a pool. Granted Snax is a little different as it rewards more interactions than just upvotes, but still think it's the same basic concept. If anyone can get into contact with @nathanmars let me know as I think this will be a great project that can be added to his Seven77 project to help encourage people to promote and interact with Steem content in Twitter. Just think using Snax and promoting your Steem content on twitter will not only drive more traffic and upvotes on Steem for your content, but it will also help you earn another crypto as well. I think this will also be a great crypto to support @abh12345 Engagement league when it moves to Steem. It will be interesting to see the rankings from his calculations on engagement vs the way Snax will be calculating engagement. Anyways I can't wait until Snax comes to Steem because I think these two projects will be a great complement to eachother. It would be awesome if they worked with Steem-Engine to get listed on the exchange as a possible base pair for "SMT's" on the platform. Would be another great way for Steem outsiders to get introduced to Steem based tokens that don't currently have Steem accounts. Finally, looking forward to a smart contract decentralized giveaway system for Twitter. So often I see giveaways on Twitter without any way to validate these have been completed. Snax will allow smart contracts to be developed, from what I understand, that can automate and make public said giveaways so anyone can track and verify they happened on the blockchain. Very cool in my opinion.